Updated with a new nose and an eight-speed automatic in 2015, the LX still rides on essentially the same platform with basically the same engine from its 2007 debut. It feels it. Despite making a healthy amount of horsepower, the LX’s big V-8 feels neutered by its transmission; it’s geared tall and also programmed to get to eighth gear and stay there. The ride is hit or miss, too. In contrast to its ungainly manners on the freeway, the LX 570 was pleasant crawling in the dirt. The brake dive, body roll, and ever-hunting transmission all seem cured of their ills at low off-road speeds. The suspension’s ability to soak up impacts before transferring them to the driver’s seat was particularly impressive. 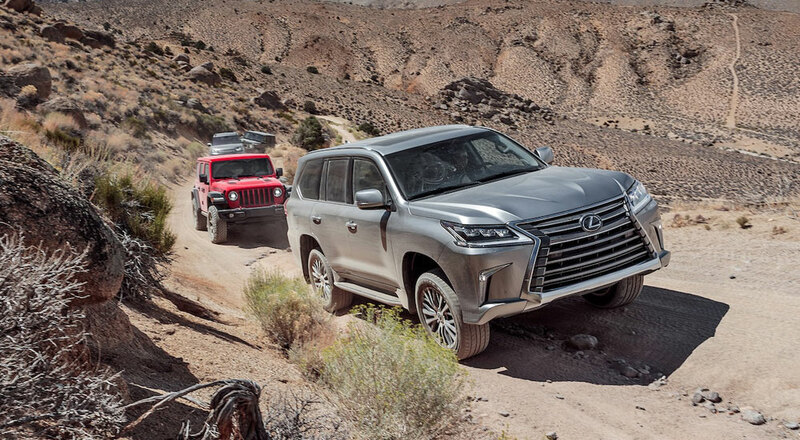 There’s still room for improvement; like off-roaders of yesteryear, the Lexus’ steering wheel violently seesaws from left to right as it deals with obstacles. As disappointed as we were with the Discovery, we were pleased with the Lexus after its performance that day. The old dog may have been just that on the road, but it proved a dogged climber on Coyote Flat Trail. “As challenging as that trail was, the Lexus deserves credit for never letting us down. It was too big for the surroundings, but even on the mildest of truck tires, it never struggled,” Woodard said. The LX made it up the trail, but it left us wanting for more refinement.